Stripped Leads Standard. Connector options also available. Omega's RTD Class B Pt100 elements with attached lead wire in a convenient 5-pack. 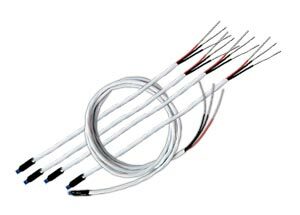 These industrial grade RTD sensors are supplied with attached lead wires for added flexibility in many different applications. The size of the potted junction between lead wire and element is kept as small as possible. Note: These elements are not intended for direct immersion into liquids. Configurations below reflect 1 m long lead wire, Style-2 (3 Wire). F3102 (4 x 2 mm) RTD element, PFA insulated lead wire, epoxy transistion. F3105 (2 x 2 mm) RTD element, PFA insulated lead wire, epoxy transistion. F3105 (4 x 2 mm) RTD element, Fiberglass insulated lead wire, ceramic transistion. F3105 (2 x 2 mm) RTD element, Fiberglass insulated lead wire, ceramic transistion. 2.8 dia x 25 mm Long wire wound RTD element, PFA insulated lead wire, epoxy transistion. 1.5 dia x 25 mm Long wire wound RTD element, PFA insulated lead wire, epoxy transistion.